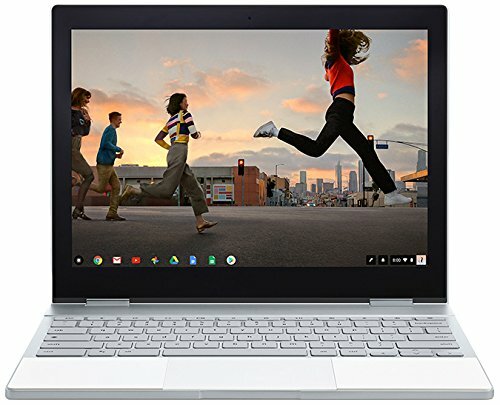 Since the release of the first Chromebooks in 2011, the market has matured and today there are a lot of Chromebooks to choose from as a customer, so let’s take a look at 6 Chromebooks for college, kids and RV Living purposes. Battery life is always important, but especially on a computer aimed towards bloggers and college students that mostly use it to write and browse the web and spend a lot of time away from outlets. It’s also great for campers that want to be able to work out in nature or wherever you have parked your RV. There are more pros about Chromebooks that I will go more into later. The definition of a Chromebook is a notebook or tablet running Chrome OS as its operating system. Google announced Chrome OS in 2009 and two years later it was released with Samsung and Acer products. In the beginning, Chromebooks only supported Chrome Apps, but since 2017 all Chromebooks released can also install and run Android apps to be more useful. Having access to the Google Play Store means that you have a whole store with apps in all categories, the same apps available on your phone if you have an Android device. I’ve gone more into depth in the FAQ at the bottom of the post about Chrome OS and what makes it different from operating systems like Windows or Mac OS X. I also help you install the Google Play Store on Chromebooks that don’t have it already. I’ve only picked Chromebooks that come with at least 4GB of ram, as you shouldn’t accept anything lower in 2018. If you’re looking for an entry-level Chromebook with great battery life, the Samsung Chromebook 3 is a good choice. Although it’s missing a touchscreen, it’s a good-sized Chromebook for college as the 4400 mAh battery will get you through a whole day. If you’re looking for ways to save battery life you should check out the FAQ where I answer a question about this. It has an HDMI port so you can connect the Chromebook to a big screen and you can choose between 16, 32 and 64 GB internal storage at purchase. A MicroSD Card Reader will be great to transfer photos and videos from your camera, phone or GoPro but it would’ve been greater with a full-size Card Reader. One feature that is somewhat normal with Chromebooks is that they’re water resistant. This Samsung model is also water-resistant which could make it great for a first laptop for a child. An 11.6” screen might sound small for a notebook, but it makes it portable and lightweight. It has a built-in HD webcam. What I am missing the most on the Samsung Chromebook 3 is a USB Type-C port. With a USB-C port, you would be able to sit out in the woods and charge it with a portable solar panel, or a battery pack. The fact that the only way to charge it is through an outlet limits you as a user to where you can use it. A backlit keyboard would have also been nice for late nights. This Chromebook from Asus is advertised as ready for drops and spills due to rugged construction. Remember that it’s only the keyboard that is spill resistant though, so it’s not something you should bring with you to the tub. The 11.6” Chromebook is available in 16 or 32 GB storage capacity and is, unfortunately, missing both a touchscreen and USB Type-C. It has a built-in HD webcam. Where the ASUS C202SA-YS02 beats the Samsung is in the weight category, it’s about .3 pounds lighter and has a slightly more narrow form factor while sporting a screen the same size as the Samsung model. It has two, instead of one USB 3.0, and a full-size SD Card Reader as well. There’s also an HDMI output so you can connect it to your tv etc. Now we’re getting into the Chromebooks that have touchscreens and allow you to use them more like a tablet. Not only by touching the screen but by folding the 360-degree hinge “the wrong way” so the screen is facing up and the keyboard down. Doing that disables the keyboard so you can put it down on a table without it accidentally typing. The R 11 from Acer has an 11.6” screen and comes with 32GB of storage, 4GB ram and will last up to 10 hours before needing a charge. I would have liked to see a bigger battery than 3220 mAh. It has a built-in HD webcam. No backlit keyboard, no USB-C, but we do get an HDMI port and two USB ports, only one being USB 3.0. The Acer R 11 is a good entry model if you want a notebook that can also be a tablet. Install games from the Google Play Store and play them with your fingers on the screen instead of on the touchpad. Buy a stylus and use it for drawings if you want. It’s easier to use apps made for touch on a touchscreen, and it makes more sense to do so. I like this kind of Chromebook that can do more than just be a notetaker. It’s too bad it doesn’t have a USB-C port! R 11’s big brother is the R 13. What’s the difference between the two? Well, first off the screen is bigger at 13.3” with a 1920 x 1080 resolution. The battery is 36.7% bigger (4670 mAh) which increases the battery life by up to 2 hours. That might sound like a small increase, but it ends up having 18% better battery life than the R 11. Take into account that a larger screen with a higher resolution uses more battery than a smaller one. You might have realized by now that I praise USB-C and the R 13 does come with a USB-C port that lets you charge the computer through it. I will answer in the FAQ what I like so much about USB-C. You also have an HDMI port. Oddly enough, the R 13 only has a Micro SD Card Reader and not a full sized one like the R 11. But it is thinner than the R 11. Flip the screen, and you will have a big tablet that will be awesome for games. It has a built-in HD webcam with HDR support. I would have liked to see a few things done differently with the Acer R 13. I would have liked 8GB of ram instead of just 4GB. 4GB will be enough for most people, but if you’re browsing and using several tabs you might see slower performance and adding 4GB more ram would have taken care of that. I also would have liked a backlit keyboard, and last I want to be able to buy it with more internal storage than 32GB. Acer also makes an R 15 model that has much better performance and an even bigger screen but it takes a hit in the battery life, so I decided not to include it in the comparison today. Click here to see the R 15 model on Amazon. In my opinion, the Acer Chromebook R 13 is the best Chromebook for college students and bloggers. 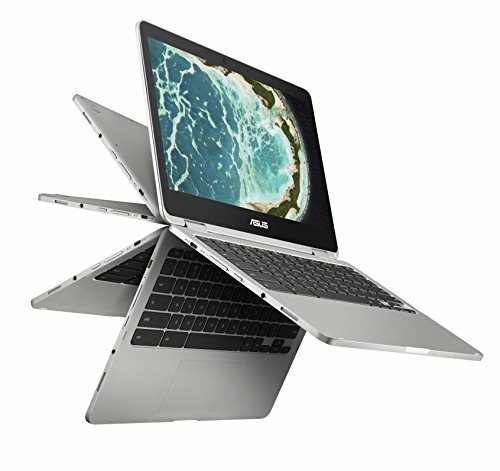 Asus has also entered the Chromebooks market, and I believe they have done a great job here. This model has a 12.5” full-HD touchscreen with 64GB flash storage and gorilla glass for durability. The 360-degree hinge will let you decide if you want a notebook or a tablet at any moment. It has both a USB-C port and a backlit keyboard. You can choose between an m3 or m5 processor. Unfortunately, we’re stuck with 4GB of ram. It also has a built-in HD webcam. Up to 10-hour battery life from the 5065 mAh battery that should last you all day without any issues. And if it doesn’t, you can carry a battery pack with you and charge via USB-C. 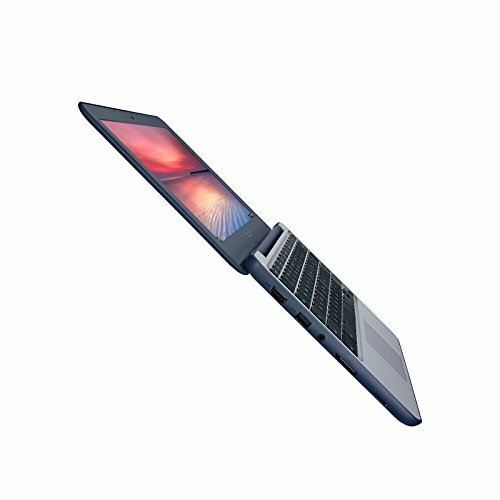 The ASUS C302CA-DHM4 is thin (0.5”) and lightweight for a 12.5” notebook. In my opinion, it’s the best-looking Chromebook in today’s comparison. The only thing I would have liked to see different would be thinner bezels. A Chromebook with thin bezels is a rare thing today, but it would have looked gorgeous. This Asus model has a micro SD Card Reader and not a full sized one. We’re also missing a regular USB type A and an HDMI port. Google’s Chromebook is called the Pixelbook and is a beast for a Chromebook. The 12.3” touchscreen has a resolution of 2400 x 1600. 128GB storage, 8GB ram, Intel i5 7th Gen processor, and up to 10-hour battery life. It supports fast charging which will give you 2 hours of use from a 15-minute charge. It has a built-in HD webcam. The Google Pixelbook has a backlit keyboard and is the thinnest Chromebook in today’s comparison at only 0.44” thin. The screen will flip and turn it into a tablet when wanted. Google sells a Pixelbook Pen as an accessory that you can use to write, draw and design on the Pixelbook. It also has a dedicated Google Assistant key on the keyboard, you can also say “Ok Google” to activate it. Where it falls short is the inputs/outputs. It only has two USB-C ports and one 3.5 mm headphone jack. It’s great that it is USB-C, but since that is the only port available, it means that you have to buy and connect a dock to get ports like HDMI, SD Card Reader, and the old style USB. Missing an HDMI port can be inconvenient if you’re in college and need to plug your notebook into a projector etc. that doesn’t have a USB-C port. The 3:2 aspect ratio can feel a bit strange in notebook mode if you’re used to 16:9, although easier to get used to and works great in tablet mode. Of course, it’s something that you can most likely get used to. If you’re buying a Chromebook, you’re probably not looking for incredible performance but portability and battery life. Chrome OS is a smaller operating system as well, so it’s a more accessible entry to a notebook for a child compared to a Windows or OS X notebook. And since 2017, you’re not as limited with apps as before since you get the whole Google Play Store to download apps from. For somebody that wants to be able to charge their notebook with portable solar panels and stay out in nature far from outlets, I recommend getting a Chromebook with a USB-C port. If you plan on using it in college, look more at the battery life and inputs/outputs like if there is an HDMI port. You will also have to decide if you feel the need for a touchscreen. A touchscreen will be essential when you flip the screen and turn it into a tablet. But if you already have a tablet running iOS or Android, you might not feel the need to spend the money to get a touchscreen on your notebook. 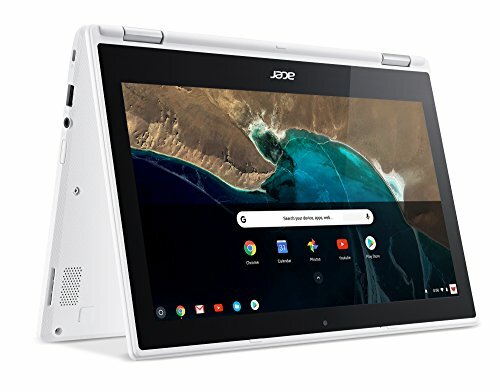 For kids/entry model: Acer Chromebook R 11 – This is a good Chromebook entry model that will be great if you want a notebook and tablet in one. Up to 10-hour battery, 32GB storage, and a touch display that will handle both school work and games. 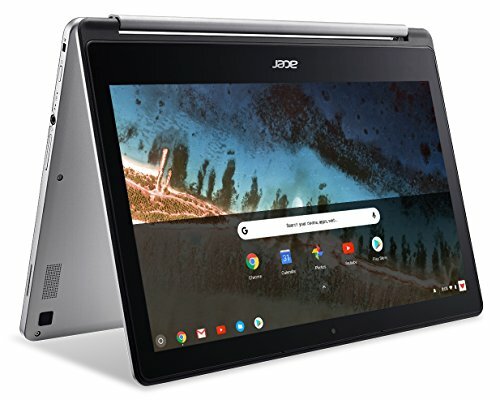 For College/Work: Acer Chromebook R 13 – The big brother to the R 11 will include a USB-C port that will come in handy in the future. But it still has an HDMI port. 1080p resolution on a 13.3” screen will be great for working, and the up to 12-hour battery life will let you work all day. Can quickly be turned into a tablet with the touch display. For the RV Life: ASUS C302CA-DHM4 – Although it doesn’t have the best advertised battery in today’s comparison, a 5065 mAh will last you for hours under regular use, and the 64GB internal storage will let you keep a bunch of pictures and videos stored on it. A 12.5” full-HD screen will look great and be portable enough to carry around outside. If you’re running out of battery, you will be able to charge through the USB-C port. For performance: Google Pixelbook GA00122-US – If you’re looking for a natively-supported powerful Chromebook, the Google Pixelbook will be it. Intel i5 processor, 8GB ram, and 128GB of storage is more like a regular laptop than a notebook. But don’t let the specs mislead you, it’s still a Chromebook that can turn from a notebook into a tablet and run apps from the Google Play Store. An extremely thin and lightweight notebook with a backlit keyboard. What makes Chrome OS different from the more popular operating systems like Windows or Mac OS X? Chrome OS, Windows, Mac OS X, etc. are all operating systems. An operating system is basically the manager of the computer. It makes sure the hardware and software are working together and handles applications running and closing as you want. The more noticeable difference you will find as a user is that they run a different kind of software. If you have used a Windows operating system, you might know of the .exe file extension which is an executable file for Windows. On Mac, applications come in .dmg files. A .exe file can’t be run natively on Mac due to not being compiled for the Windows operating system. On Chrome OS, you can either install extensions from the Chrome web store which is for the Chrome web browser. Or you can download apps from the Google Play Store. These apps are .apk files. These can’t be run natively on either Windows or Mac without additional programs installed. So the big differences are the programs and file extensions they’re made to run. I would argue that a Chromebook is a more safe choice for a beginner or somebody who isn’t very tech-savvy. Reason being that the way you install apps is from the Chrome Store or the Google Play Store. Each app on the Google Play Store has gone through Google’s reviewing process. Although not as complex as Apple’s process for apps entering the App Store, it’s looked at more than a lot of the .exe files available online. It’s also easy to set parental control in the Google Play Store to decide what your child should be able to view and download. 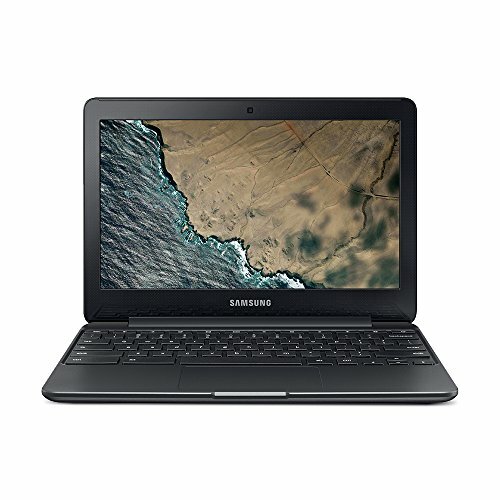 What should I consider before purchasing a Chromebook? Apps – What kind of programs do you need to run? If most of your programs are Windows applications and there is no alternative on the Google Play Store, a Chromebook will make you feel limited. Performance – Depending on what programs you use in daily life, you might need more performance. If you’re a professional video editor or want to be able to play games that require graphics power, a Windows laptop with dedicated graphics will be more powerful than integrated graphics. You might also need more ram if you edit videos, make music, or do photo editing. Notebook/Tablet – Do you want to be able to use it as both a notebook and a tablet? A Chromebook can be the best tablet in the 2-in-1 market due to access to the Google Play Store and the millions of apps available. There are Windows laptops that can turn into tablets with touchscreens just like a lot of Chromebooks can. But I believe it’s easier to navigate through Chrome OS and since you get the Google Play Store, you will have access to millions of apps made for touchscreens. But if you need better performance, program support, and want to be able to use it as a tablet as well, I would go for a 2-in-1 Windows laptop like the Lenovo Yoga 730 2-in-1. What’s the deal with USB 3.1 Type-C? USB 3.1 Type-C is a very versatile new version of USB. You know how you usually plug your mouse into a USB-port? Imagine a USB-port that can do so much more than that. Peripherals, monitors, phones, headphones, speakers, and even power, all at once. USB 3.1 is capable of speeds fast enough to handle this, and that’s why it has been getting a lot of praise and why you’ll see it in more and more consumer electronics. It also solves the most significant problem people have with USB, it’s reversible, so there’s no up or down when you plug it in, what else do you need? The reason I like it so much is that it can charge electronics. If supported, it can charge a phone or a laptop. What this means is that if you’re away from outlets, you can use a power battery pack like the Anker PowerCore+ to charge your devices. Pair that with a portable solar panel like the RAVPower Solar Charger and you can be away from outlets without running out of battery. It’s futuristic, and it works. To figure out how much storage you need, you can get a clue from your phone. Look how much storage it has and how much you have filled it with photos, videos, etc. Are you planning on putting all your pictures and videos on your notebook? Videos take up a lot more space than photos. If you only plan on using Microsoft Word and download and write documents, it will take a while to fill 64GB. You can always add an SD Card to the Chromebooks that support it to get more storage. Prices on SD Cards have gone down a lot lately and you can double your storage for a reasonable price. Samsung makes memory cards in different sizes that I have bought myself and they’re fast and reliable. Can I get Microsoft Word, Excel, and PowerPoint on a Chromebook? If you don’t want to use Google’s alternatives that come pre-installed on Chromebooks, you can download Word, Excel, and Powerpoint from the Google Play Store. How come I can’t see the Google Play Store on my Chromebook? If you have an older Chromebook that doesn’t have the Google Play Store app in the menus, you will have to change some settings. It should work without issues but be aware that you’re doing this on your own risk. Click at one of the icons in the bottom right corner. This will download a beta release of Chrome OS, install and restart when done. Agree, Sign In, and Accept and you will have Google Play Store on your device. How do I make the battery last longer on my Chromebook? Screen brightness – One of the most important ways to extend your battery life is by turning down screen brightness. Just keep it at the level to where you can see the screen. When outside, you will most likely need a higher brightness level to see the screen. But when indoors at night, you will be able to see the screen even at 25% brightness. You can save a lot of power by turning down the brightness. Turn off the screen when away – It probably goes without saying, but don’t leave the screen on when you’re not by the computer. A screensaver will still leave the screen on. Make sure it turns off instead to not waste power. Turn off WiFi and Bluetooth – If you don’t need WiFi and Bluetooth at the time, turn it off. Even though not in use, both will consume a small amount of power. Turn off apps – Only leave apps open while you use them. In Chrome OS you can see which apps use the most battery by going to Battery in the Settings menu. Don’t update apps – I always advocate updating apps to get the latest features, but if you’re on battery and need it to last you shouldn’t update the apps while not connected to a power source. Chrome OS will update itself automatically in the background, but updating apps in the Google Play Store is a choice unless you’ve opted for automatic updates. Know that higher performance costs battery – Running Photoshop or games will take more power to run than a web browser like Chrome. If you need the battery to last you can’t spend hours playing games because it will require more performance from the computer and drain the battery faster. Another way to make your battery last longer is with a portable power bank, I have written a post about the best power banks on the market that you can get to by clicking here!